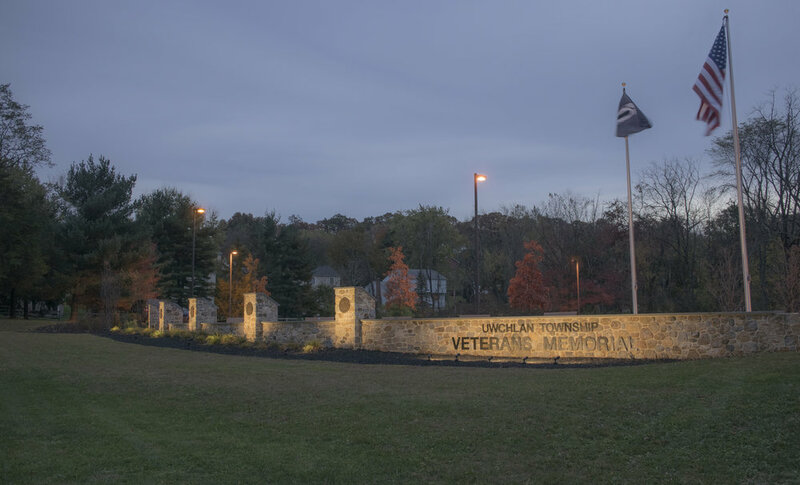 Uwchlan Township and the Hankin Group engaged Orsatti + Stuart to design a veterans memorial on the township grounds, which honors all the sacrifices of our veterans. The design process involved engaging the local community, veterans organizations, and township staff. What began as several distinctly different schematic design sketches, evolved into one cohesive design which winds its way through the 2 acre site. The final design includes: stone pillars mounted with memorial plaques for each branch of our military, large gathering space for future events and ceremonies, seating opportunities for reflection, ambient lighting highlighting signage and intricate stone work, and a Minuteman Statue memorializing George Washingtons time spent in the Uwchlan Township area. The Uwchlan Township Veterans memorial can be found via a meandering path adjacent to the Uwchlan Township’s extensive trail network.